This ancient habitational surname is believed to derive from a small Scottish estate in Dumfriesshire originally called "Marchbank". It seems that in or about 1315 Marjone Bruce, the daughter of King Robert 1 of Scotland married Walter Stewart, and the "Marchbank estate" formed part of her dowry. In honour of this event the estate was renamed although the estate holders (Marchbank) retained that spelling until the 15th Century. With surnames anything is possible and whether true or not, the story is worth telling, and in any case "something" caused the name change. 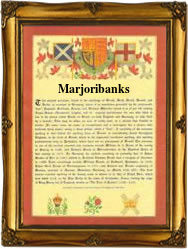 In or about 1780, one John Marjoribanks, being then Steward to the Marquis of Bute, prepared a family history with written evidence which he presented to the Marquis. Unfortunately, this Tome is now lost and with it the documents relevant to the family traditions. Curiously, in the mid 18th Century a number of members of the clan "emigrated" to Yorkshire. It is first recorded in the village of Hardrow, North Yorkshire, as Majorybank in 1761, but has also been found as Margerbanks. The original 1673 Coat of Arms is a silver field, a red mullet, on a black chief, a gold cushion, the latter implying a relationship with the Johnsons of Annandale. The first recorded spelling of the family name is shown to be that of Philippus de Marjoribankis be eodem, which was dated 1485, a deed witness in Dumfriesshire, Scotland, during the reign of King James 111 of Scotland, 1460 - 1488. Surnames became necessary when governments introduced personal taxation. In England this was known as Poll Tax. Throughout the centuries, surnames in every country have continued to "develop" often leading to astonishing variants of the original spelling.